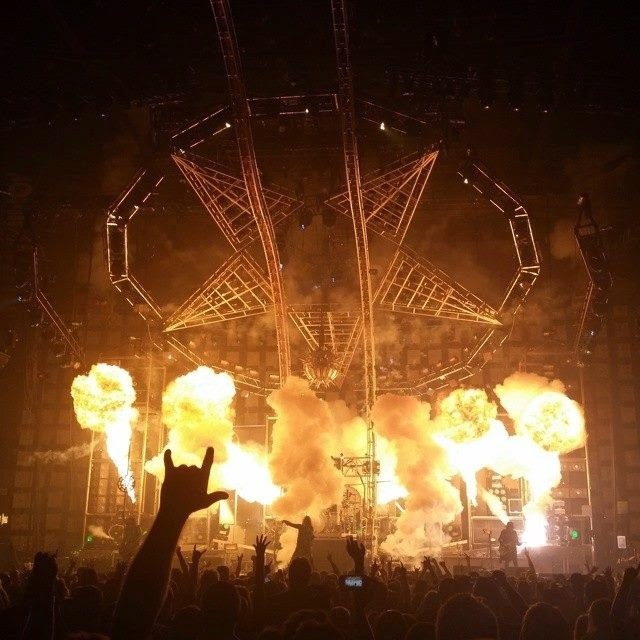 Motley Crue launched their farewell tour Wednesday night in Grand Rapids, Michigan, and fan-filmed video of opening night has surfaced. MLive reports the tour got off to a rough start at the Van Andel Arena, with technical problems derailing the first half of the show. Drummer Tommy Lee broke the head on his kick drum three songs in, prompting Mick Mars to fill time with a guitar solo, which eventually ran out of steam; the house lights came up and the crowd got restless. After a 10-minute delay, the band made a decent recovery, chugging through “Same Ol’ Situation” and “Looks that Kill.” “On With the Show” was supposed to merge with “Too Fast for Love,” but the band stopped dead in its tracks. “He broke something again,” Neil said of Lee. “The band forgot their own song,” bassist Nikki Sixx said. They restarted and powered through the number, Sixx visibly upset and off his game, and Neil looking confused. Then Mars experienced problems with his monitors and guitars; cue another delay, and a few boos. “Oh man. First-night (expletive). We’re breaking down. You guys can always say you were here,” Neil half-heartedly joked. Read the full review of opening night at MLive here.